chuck popped it in the player and as soon as i heard the opening chords of simon & garfunkel's 'sound of silence' and saw dustin hoffman breezing along the airport moving walkway, my eyes welled up. suddenly, i was back in my living room, sitting on our shag green carpeting only a few feet from our console TV, hoping my brother pat, who was sitting behind me (on the davenport, as mom used to call it) wouldn't make me turn it off. lucky for me, it was league bowling night, which meant my folks were out for the evening...my mom surely wouldn't have allowed my 3rd grade eyes to witness such a sexually charged film. not to mention the fact i'd rack up multiple cancers for sitting so close to the TV. 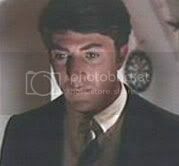 i fell in love with dustin hoffman that very moment..it was the first in a long line of celebrity crushes. his character, benjamin, was so appealing to me...wandering throughout much of the film like a lost puppy, so jaded with life at the ripe age of 20, yet still so lovable...and those eeeeeeeeyes. grrr. now i think i clicked the wrong thing. did this go to chuck? should i give up on all things computer? !